He has frequently nodded off as witnesses and wiretapped conversations have been used by the prosecution to establish the sports betting, loansharking, extortion and illegal video poker machine operations that are at the heart of the case against Ligambi and his top associates. Licata, who was based in Newark, played no role in those gambits. As the trial moves into what is expected to be its final phase, he has emerged as little more than a bit player, a capo who had a title but little to do with the crimes that have been outlined. In many ways, he is like an opening act who is quickly forgotten once the headliner takes the stage. Licata's voice bounced all over the courtroom during the opening days of testimony back in late October. He was the principal speaker in a secretly recorded mob meeting at La Griglia, a North Jersey restaurant where members of the Philadelphia crime family met with leaders of the Gambino organization in May 2010 to talk business. The taped conversation, made by Nicholas "Nicky Skins" Stefanelli -- a cooperator who later committed suicide -- was described by Assistant U.S. Attorney Frank Labor as a meeting of "the board of directors of organized crime." Licata's attorney, in his opening, begged to differ. "This was just a bunch of geriatric gangsters talking about the old days," said Christopher Warren. Licata, who got the nickname "Scoops" because of his penchant for spreading underworld gossip, had something to say about nearly every major player in the organization. One of 10 mob figures breaking bread and drinking wine, he dominated the conversation. But while he joked, laughed and made asides about the violent history of the Philadelphia crime family, virtually nothing he said that day, Warren has agrued, had anything to do with, or was even remotely related to, the charges in the pending case. Only one witness called to the stand, Peter "Pete the Crumb" Caprio, has mentioned Licata by name. Caprio, also from the Newark branch of the Philadelphia crime family, said he and Licata were capos in North Jersey. But Caprio, at 83 one of the few mobsters linked to the case older than Licata (Ligambi, at 73, is another), was arrested in January 2000 and began cooperating a short time later. The current indictment spans a time frame from 1999 through 2011. Caprio was either in jail or in the Witness Security Program for most of that time so what he was able to offer about Licata was history. That Licata is a member and capo of the crime family is not in dispute. 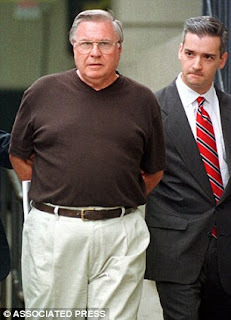 In fact, he admitted as much when he pleaded guilty to a racketeering charge back in the early 1990s. What he's doing in the current case is the question Warren hopes to underscore when and if he makes his closing argument. First Warren is expected to file a motion at the conclusion of testimony asking U.S. District Court Judge Eduardo Robreno for a directed verdict of acquittal, contending that the government has failed to prove its case against his client. Those so-called "Rule 29" motions are almost boiler plate and are frequently offered by defense attorneys at the end of complicated racketeering trials. In most cases, they are rejected. Warren hasn't shown much of his hand thus far. There has been little need to cross-examine witnesses or challenge evidence that hasn't impacted Licata. But like several other defense attorneys, he has described the racketeering indictment as overly broad and an attempt to connect the dots in a series of unrelated entrerprises. One charge against Licata is that he helped arrange a no-show union job for Louis "Big Lou" Fazzini, another North Jersey member of the Philadelphia crime family. Fazzini is one of four defendants who pleaded guilty before the start of the trial. The no-show job and Fazzini's role as a bookmaker are linked to Licata in the indictment. But little has been said about either crime during the trial. On Wednesday, as a key government witness parried with defense attorneys, Licata sat quietly in his chair up against the wall in the wood-panelled courtroom. His head bobbed occasionally, but for the most part he seemed to be following the testimony. Once again, his name was not mentioned. Joseph Procaccini, the owner of a video poker machine company, has told the jury that in 2001 Ligambi and two top associates, mob underboss Joseph "Mousie" Massimino and Anthony Staino, forced him to give up 34 poker machines and 21 South Philadelphia locations in what the indictment alleges was an act of extortion built around the threat of violence. The defense has countered by arguing that the machines were purchased by a company controlled by Ligambi, Massimino and Staino and were part of a legitimate business deal. "Absolutely not," Procaccini said during his direct testimony. He stuck to that position during cross-examination Wednesday, again claiming that the mobsters paid $63,000 for machines that generated between $85,000 and $120,000 annually. "That's not good buisness," said Procaccini, 53, who said he has an accounting degree from Villanova University and who continued to insist that neither he nor his partner wanted to sell anything to Ligambi and his associates. "Isn't it true that (after the deal was completed) Mousie said to you that 85 percent of those machines weren't making any money," defense attorney Edwin Jacobs Jr. asked. "He did say that," Procaccini said in a soft but firm voice. "And I said, `Well, give 'em back to me, then.'"